Do you get that “deer in the headlights” look when it’s time to buy a gift for your favorite middle-schooler? You know they’re probably too old for children’s books, but they may not be ready for (or care about) all the romance that seems to be in every Young Adult novel. Well, thanks to my own twelve-year-old (who wasn’t quite as helpful as I’d hoped he’d be) and a few other parents of middle-schoolers, I was able to put together a list for you. My Side of the Mountain by Jean Craighead George is an older book (I read it when I was a kid), but it’s my son’s favorite book. He got it from the library, then asked for his own copy, which he’s read countless times. He doesn’t recommend the sequels, though. He says they’re “okay”, but nowhere near as good as the first one. (As a side note, the movie follows a different storyline, and he was quite disgusted after watching it.) This is a good adventure/coming of age story. Your science fiction fan may enjoy the Animorphs series. This 54-book series is about five teens with the ability to morph into any animal they have touched. They use this ability to fight an alien invasion of Earth. These books may be a little scary for sensitive readers, but there are also humorous parts. Another sci-fi option is (are?) Star Wars books. My son recommended the 12-book Galaxy of Fear Series, but there is apparently an endless supply of Star Wars books floating around. If you’re looking for something fun and light, I can’t recommend Nate Rocks highly enough. My son and I both love these books! Karen Pokras Toz has several fabulous books, but these three made the top of the list this year. Who doesn’t love Little House on the Prairie? My son read all of these (on his own – I don’t assign books) then wanted to read the “spin-off” series. That’s all I could get out of Jack. The following books were recommended by other parents as books/series their kids love. Jack liked the Eragon books, too. I think I overloaded his brain by asking for his favorites. We even had to drive to a different library because he didn’t want to wait for the last book to make its way to our library. Hatchet is another series he read and loved. Yet another series he loved. He even owns these. He also wants to read the other related series. There you have it. Some new books, some classics, a few well-known series, along with some newcomers. Have fun shopping! 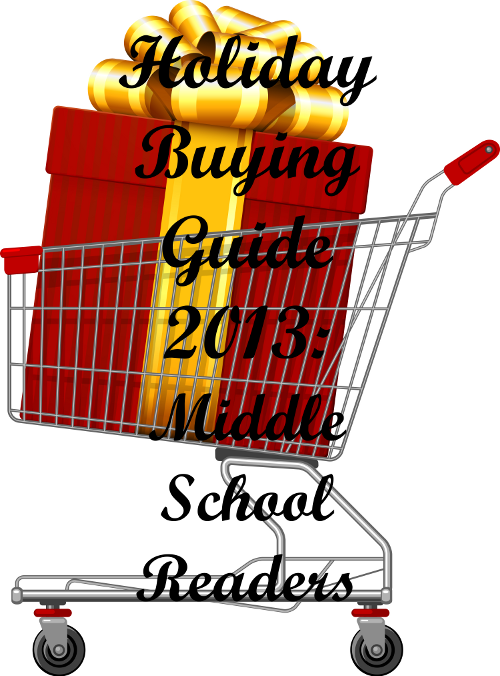 This entry was posted in Reading and tagged books, buying guide, Middle Grade, middle school by Amanda Beaty. Bookmark the permalink.